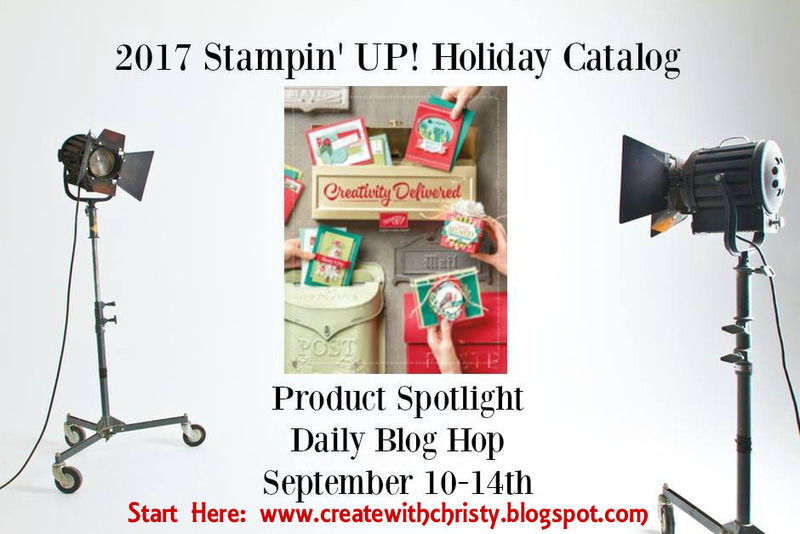 Welcome to Day Two of the Holiday Catalog Product Spotlight Blog Hop! 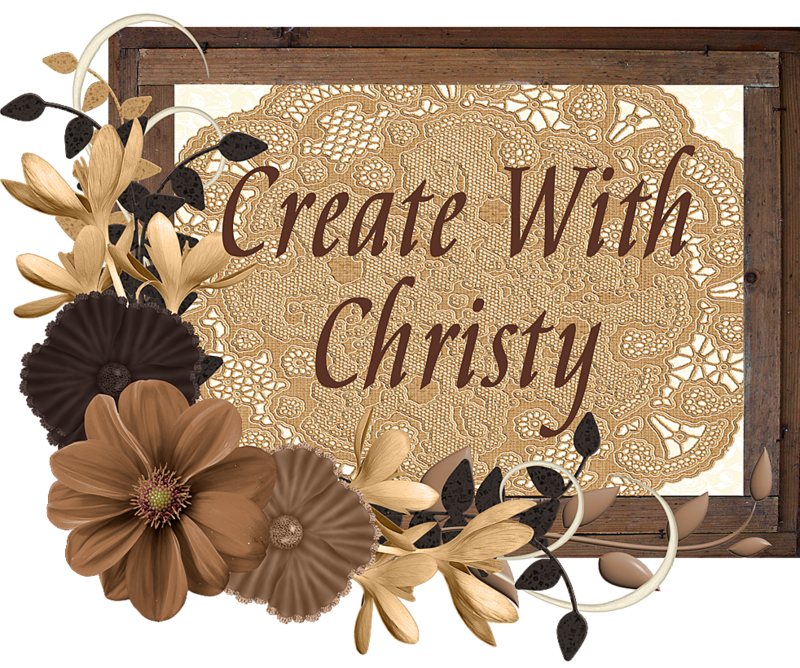 Today, we're all featuring the beautiful Vintage Crochet Trim. The Vintage Crochet Trim is so beautiful! It puts the perfect final touch on any project! On my card today, I used it as a frame around my greeting oval. It's so easy to do, too! I think it makes the card look extra special! I also used the super special, Merry Patterns Stamp Set. 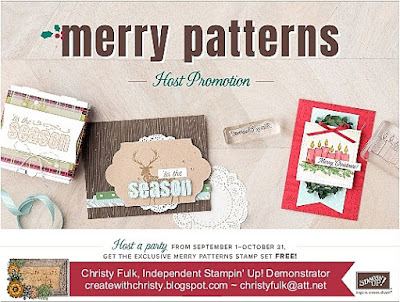 It's the host set that Stampin' Up! 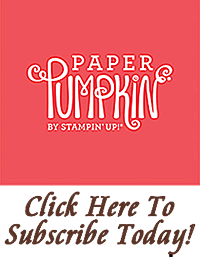 hosts get with a qualifying order during September & October...that's in addition to the regular Stampin' Rewards hosts normally earn. 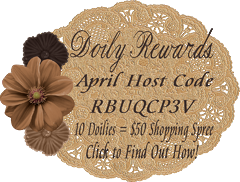 To find out more about this wonderful deal, and find out the ways you can earn it, click on the "Merry Patterns" picture at the bottom of this post. The Vintage Crochet Trim isn't bulky at all, so I was even able to use it on the inside of my card, too! It makes it look like the candles are on a crocheted tablecloth! 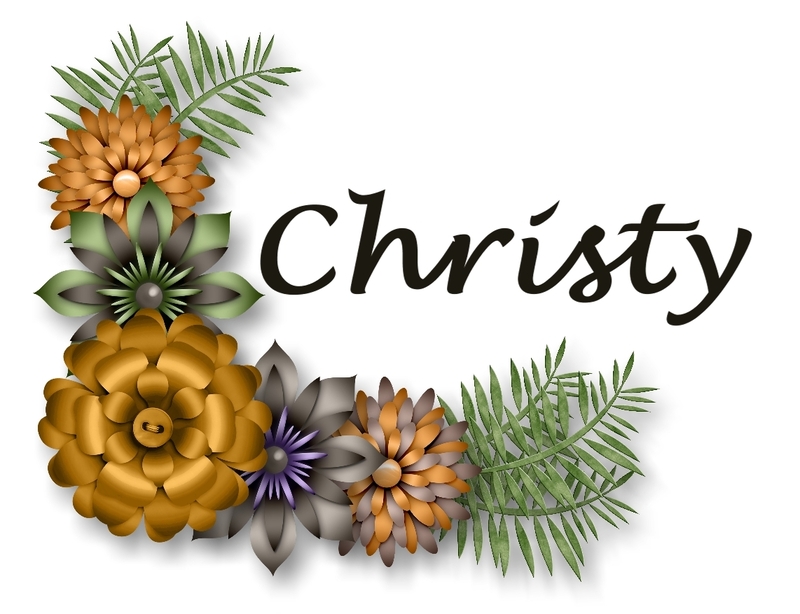 Merry Little Christmas Designer Series Paper (DSP): 2" x 4"
Emboss one of the largest Whisper White pieces by running it through the Big Shot with the Quilt Top Textured Impressions Embossing Folder. Attach the DSP piece along the center of the Basic Black piece. Attach it on the left side of the embossed piece, putting it about 5/8" away from the left edge of the embossed piece. 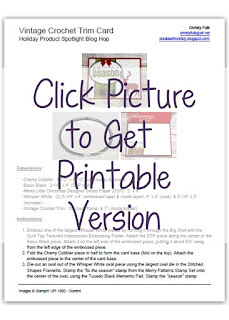 Fold the Cherry Cobbler piece in half to form the card base (fold on the top). Attach the embossed piece to the center of the card base. Die-cut an oval out of the Whisper White oval piece using the largest oval die in the Stitched Shapes Framelits. Stamp the "tis the season" stamp from the Merry Patterns Stamp Set onto the center of the oval, using the Tuxedo Black Memento Pad. Stamp the "season" stamp inside the stamped "season" outline using the Old Olive Classic Stampin' Pad. Stamp the "to be jolly" stamp underneath "season", on the right, using the Cherry Cobbler Classic Stampin' Pad. Turn the oval over, and put Fast Fuse Adhesive all around the edge of the oval. Make sure it's on the very edge of the oval. 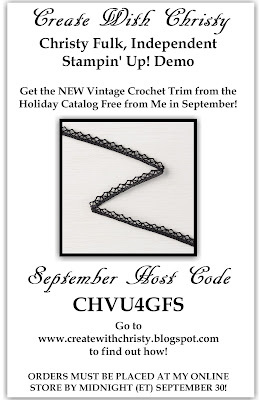 Attach the 10" piece of Vintage Crochet Trim around the oval. The straight edge of the crochet trim should be lined up along the "stitched" part of the oval. Trim the excess trim off. Then, attach it to the top, left of the card. 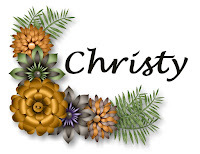 Punch the "bow" in the Holly Berry Builder Punch out of a scrap piece of Cherry Cobbler Cardstock. Attach the bow to the top, center of the oval. Then, attach a small faceted gem from the Gold Faceted Gems to the middle of the bow. Stamp the reindeer outline stamp onto the smallest Whisper White piece using the Memento Pad. Stamp the patterned reindeer stamp inside the outline using the Cherry Cobbler ink pad. Fussy-cut the reindeer out, and attach it to the bottom, right corner of the card using Mini Stampin' Dimensionals. (Inside of the card) Stamp the candles outline stamp onto the bottom, left corner of the last piece of Whisper White using the Memento Pad. Make sure to leave a little space below the candles for the crochet trim. Stamp the partial, patterned candles stamp into the candles outline, starting with the first candle, using the Old Olive ink pad. Stamp the rest of the candle outlines using the full, patterned candles stamp and the Cherry Cobbler ink pad. Stamp the flames stamp into the flame outlines using the Crushed Curry Classic Stampin' Pad. Stamp the "Merry Christmas" stamp above the candles using the Memento Pad. Wrap the 7" piece of Vintage Crochet Trim across the bottom of the Whisper White piece, attaching the trim ends to the back of the cardstock. Attach the piece to the inside of the card base. OPTIONAL: Roll a Mini Glue Dot to form a glue dot "strip". Attach it to the underside of the crochet trim, in the middle. This is only needed if the trim isn't staying in place. Now, it's time to hop on over to the next one in the blog hop, Jenn Van Wart's Blog. I used the Vintage Crochet Trim and this stamp set on my Short & Sweet Saturday's card, too. As you can see, I'm having fun with both products!